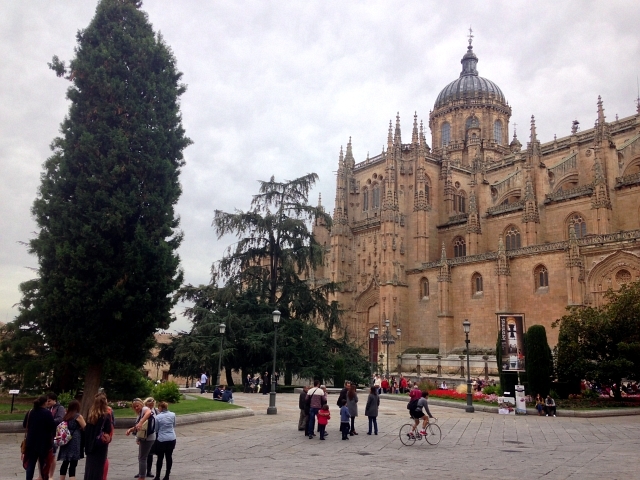 You may have read about my trip to Salamanca last year, well this is a second post all about one particular visit to Salamanca’s famous Cathedral. 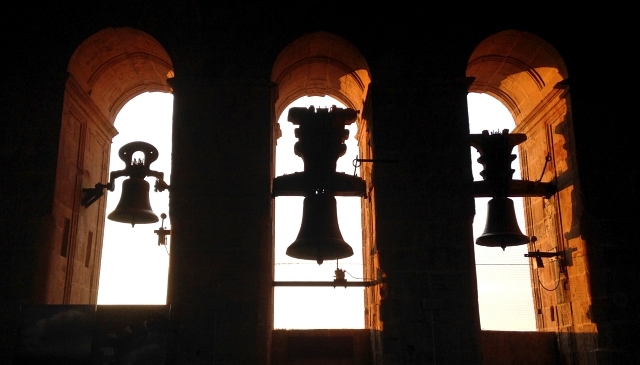 There are in fact two cathedrals in Salamanca, the ‘Old Cathedral’ and the predictably named ‘New Cathedral’ (or in Spanish ‘Catedral Nueva’). What is pretty cool and convenient is that both of the cathedrals are connected, so when you visit them, you do so together. 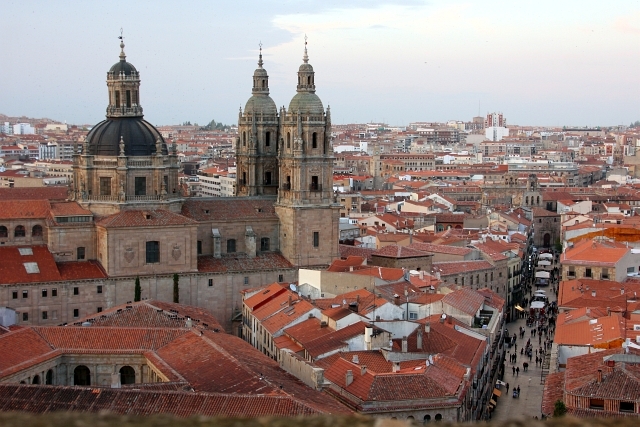 Back in 12th and 13th century, the Salamancans built the original cathedral. 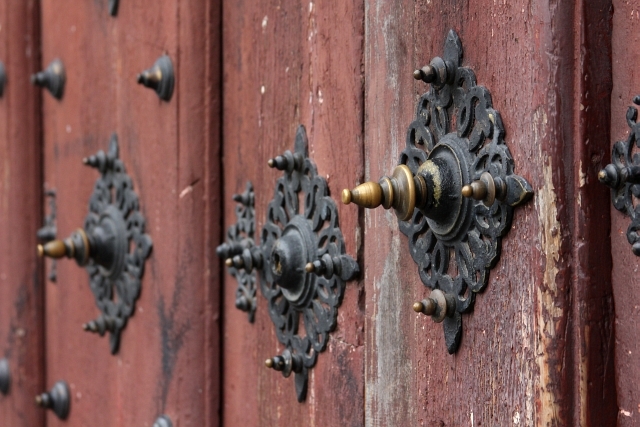 The new part was made over hundreds of years, between the 16th and 18th centuries. In fact, the construction took so long that it ended up being in two styles; the late Gothic and Baroque. It was started way back in 1513 and wasn’t consecrated unti 1733. I found it crazy to imagine the people who first designed it, died well over a hundred years before it was finished. In 1992 the cathedral had some restoration work. 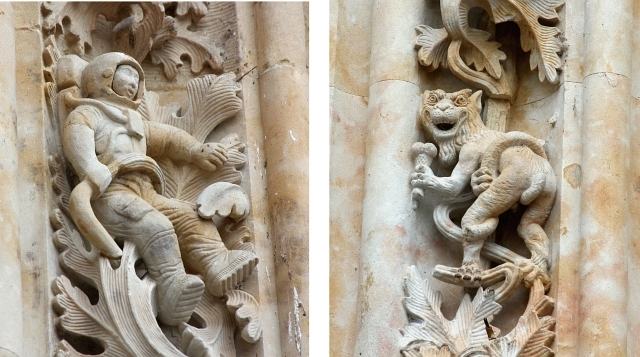 Amongst the many ornate carvings on the façade, the restorers (who clearly have a sense of humour) added a faun eating an ice cream and an astronaut. Before I heard that these were more recent additions, my mind was boggling with ideas of time travellers helping medieval carvers. 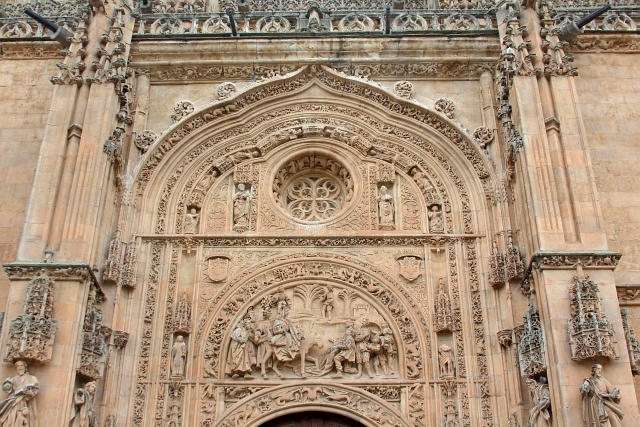 You enter the cathedral through its main entrance which consists of three richly decorated arcs. Each of these leads to the three naves. As you progress on the tour through the cathedral, you get higher and higher. I loved ducking and moving through the building. The many spiral staircases take you up and up in the many winding passageways over the upper cathedral. 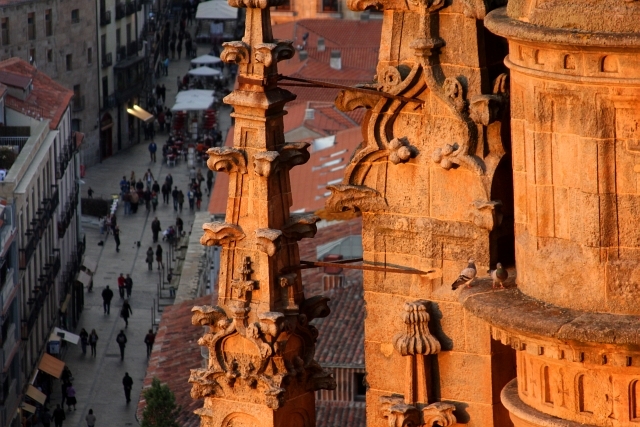 Each time you went up a staircase you felt as if you had reached the top and were experiencing the very best views of the beautiful city of Salamanca. What was great is that you weren’t and you kept going higher up and the view kept getting better. Eventually, we got to the tippity top, the 92m high bell tower. As we reached the top, the sun started to set and the already gorgeous views, got even more ‘gorgeous-er’! The building in Salamanca are built using a fantastic blond sandstone which is found in the deep quarries in the region of Castile-León. This stone is already a rich caramel colour, but in the orange light of the sunset it became even more vivid and colourful. I spent ages peering out of all the different walls and taking shots of the most stunning views I had seen of Salamanca. The people walking down in the streets looked like ants and I stayed up there savouring every last moment until the sun eventually fell out of sight and darkness began to fall. 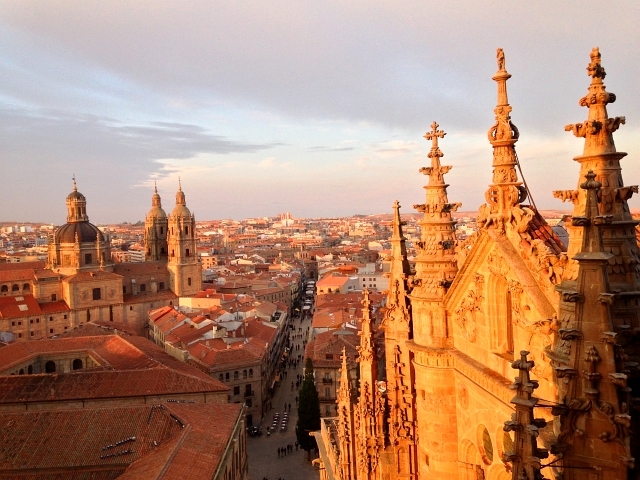 I love Salamanca and can’t wait to go back. Luckily, I’m going on another trip in May! Back in October when I went the temperature was similar to the UK, maybe a couple of degrees higher. However, when I go back at the end of May, the temperature will be getting close to Scorchio! I’m so excited about going back (and love outdoor clothing and gear so much) I’ve even started shopping ready for the trip. The first purchase I’ve made is this Nosilife Adventure Long Sleeved Shirt from Craghoppers. Firstly, it’s got as sunglasses wiping cloth built into the hem of the shirt. This is ideal as I (like most people) never carry those little wipes that come with sunglasses around with me. 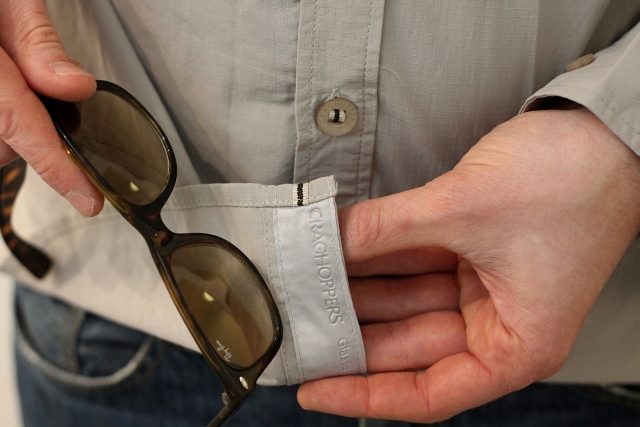 The microfibre cloth attached to the Nosilife Adventure shirt makes light work of any marks on your shades. The Solarshield collar is one of my favourite parts of this shirt. 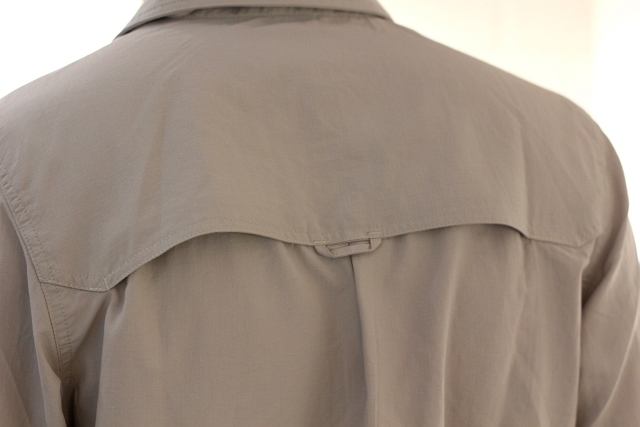 Simply, it’s a normal collar that looks very smart and just like a regular shirt. However, if you are somewhere very hot, it concertinas out to provide a really good shade for the whole of your neck. It’s not just this that makes it good for protecting you from the sun. The fabric which the shirt is made from is UPF40+ making it excellent for travelling in hot countries and in the summer. 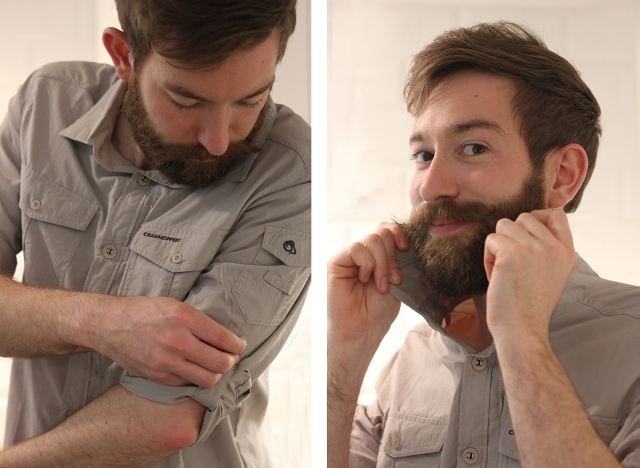 Craghoppers have designed this shirt to be excellent for wearing in really hot and humid conditions; it’s been constructed in a super lightweight manner, with material that not only dries quickly, but wickes any moisture away from your skin. A really smart feature is the vented back. Just below your shoulder blades they’ve made two special sections in the back with vented material. You can’t really see them but they really work and allow even more cool air to circulate around your body. Nosilife insect-repellent is permanently woven into the fabric which is proven to reduce bites by up to 90% and doesn’t smell or irritate in any way. Having a shirt with this is a no-brainer and something all travel clothing should have. The features don’t end there – it’s also got a hidden pocket for cash and valuables as well as roll up sleeves! I’m really looking forward to wearing this whilst travelling in Spain. It’s definitely going to make my trip a lot more comfortable and enjoyable. In fact, I might need to get a few more as I’m going to be away for a whole week.